Bunny Bouquet Towels, by Raghu. 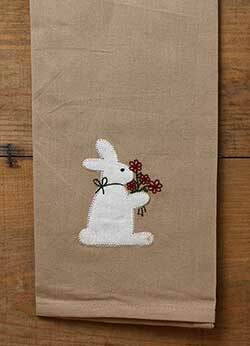 Features wool and cotton applique/embroidery of a bunny and some flowers on a tea-dyed cotton kitchen towel. Perfect for that country primitive spring! Measures 18 x 28 inches. Machine washable (see label for care instructions). This cotton guest towel features embroidered bunny and carrots, with dobby stitched detail. 100% cotton. Chick Guest Towel, by Tag. 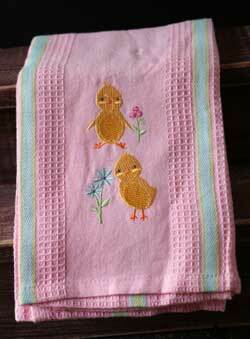 This cotton guest towel features embroidered Easter chick and serge-stitched scalloped edges. 100% cotton. Machine wash cold separately; tumble dry low. Measures 16 x 22 inches. Cornflower Patch Dishtowel, by Park Designs. 100% Cotton. Periwinkle and sage stripes on an ecru background, with an embroidered floral patch. Part of the Gardener's Journal Collection. Other matching linens available! 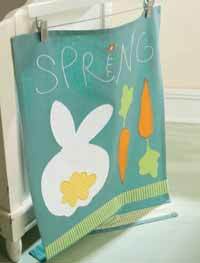 Cottontail Embroidered Dishtowel, by Tag. 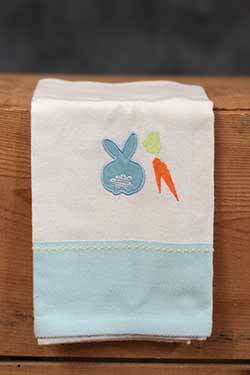 Aqua blue dishtowel appliqued and embroidered with cottontail bunny and carrot designs. 100% cotton. Machine wash cold separately; tumble dry low. Measures 18 x 26 inches. 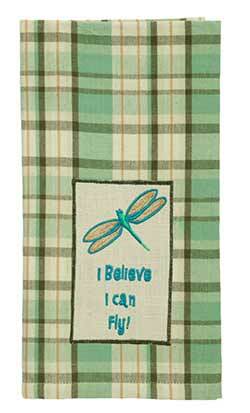 Perfect for spring or a cottage country kitchen, this dishtowel features a pretty embroidered dragonfly. Reads: I believe I can fly! Easter Bunny Towels, by Raghu. 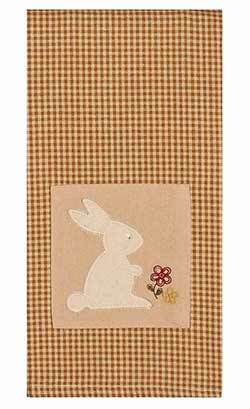 Features wool and cotton applique/embroidery of sweet bunny on a tea-dyed cotton patch, appliqued to a country mustard and tan gingham mini checked kitchen towel. Perfect for that country primitive spring! Comes as a set of TWO. Measures 18 x 28 inches. Machine washable (see label for care instructions). 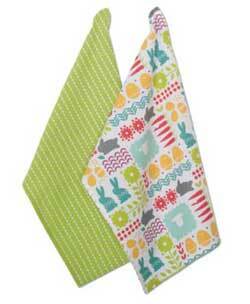 Easter Parade Dishtowel Set, by Tag. Easter on parade! Set of two Easter dishtowels includes 1 dobby-stitched dishtowel in a beautiful spring green, and 1 printed dishtowel featuring fun and festive Easter icons. Makes a great gift for the Easter hostess. Measures 18 x 26 inches. 100% cotton, machine washable. 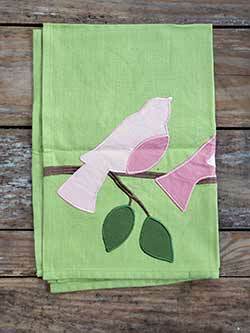 Enchanted Forest Dishtowel, by Park Designs. 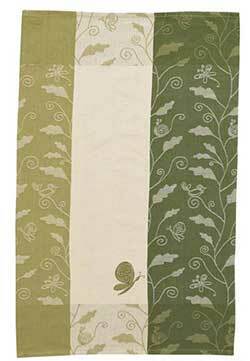 Pretty jacquard dishtowel in earthy greens and cream with woven design of vines and embroidered butterfly. Measures 18 x 28 inches. 100% cotton, machine washable. Other items in the collection also available! Lavender Dishtowel, by Split P. Part of the Bloom Collection, featuring a garden-party-inspired palette of lime, purple, lavender, and periwinkle. This is for the Dishtowel. Measures 18 x 26 inches. 100% cotton. Matching items also available! Split P is a division of Park Designs. 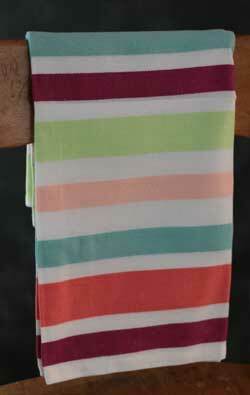 Lime Zest Dishtowel, by DII. 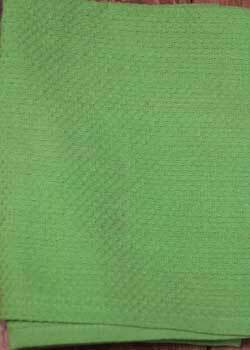 Lime green, woven "waffle." Measures 18 x 28 inches. 100% cotton, machine washable. Part of the Basics Collection. My Bunny Towels, by Raghu. 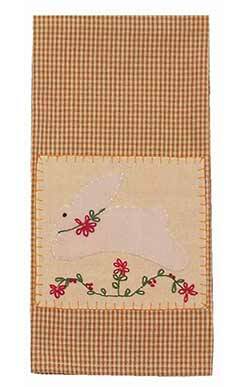 Features wool and cotton applique/embroidery of sweet bunny and little red flowers on a tea-dyed cotton patch, appliqued to a country mustard and tan gingham mini checked kitchen towel. 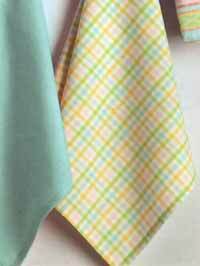 Pastel Petite Check Dishtowel, by DII. 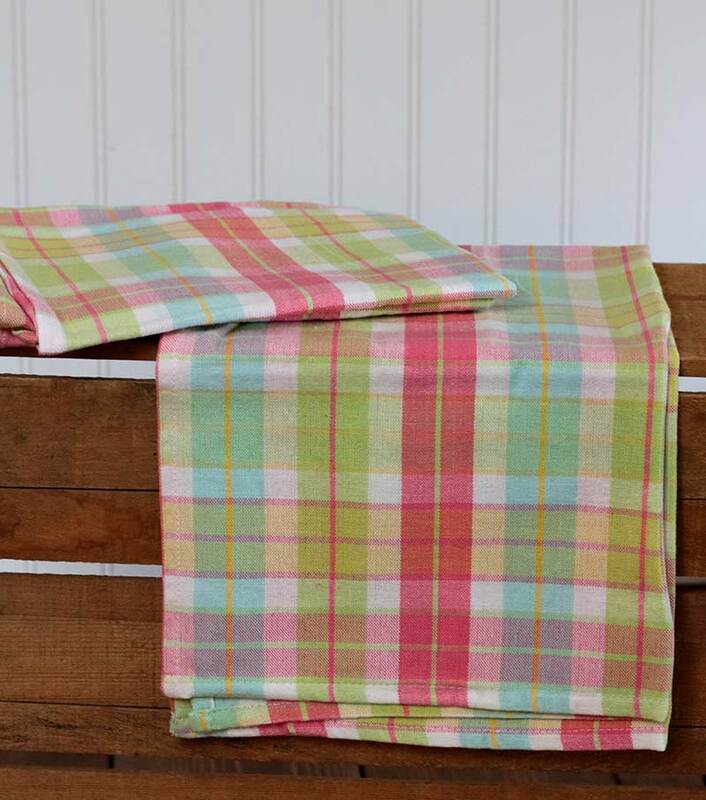 This spring-hued dishtowel features a plaid of pale pink, icy green, light aqua, and buttercup yellow against a white background. 100% cotton. Machine washable, see label for care instructions. Has a loop for hanging. Pears Embroidered Dishtowel, by DII. Part of the Fruit Salad Collection, this sunny cheery raspberry red cotton dishtowel is embroidered with green pears. Measures 18 x 28 inches. 100% cotton. Machine washable. Other items in the collection also available! 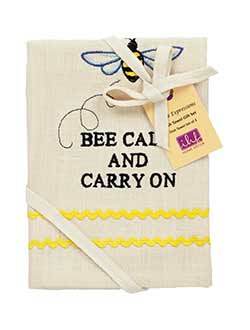 This cheerful dishtowel set is just buzzing with charm! Features a garden-inspired palette of white, lavender, and herbal greens - one allover pattern of herbs, one sage green, and one plaid with embroidered patch. 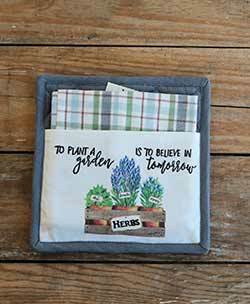 Set includes a plaid dishtowel, and a pot holder with an embroidered patch on the pocket, featuring herb artwork. Raining Rabbits Dishtowel, by Tag. 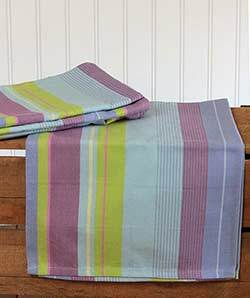 Part of the Raining Rabbits Collection, this woven cotten towel features striping in white, plum, aqua, lime green, coral, and pink. Measures 18 x 26 inches. 100% cotton. Machine wash cold separately; tumble dry low. So Sweet Plaid Dishtowel, by DII. 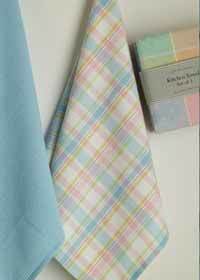 Cotton dishtowel in spring-inspired colors of light blue, pink, yellow, and white, in a plaid pattern. 100% cotton. Measures 18 x 28 inches. Spring Plaid Dishtowel, by DII. Cotton kitchen with a spring-inspired plaid of pinks, green, aqua, and white. Part of the Daisy Plaid Collection. Measures 18 x 28 inches. 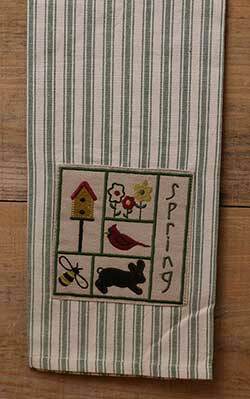 Spring Sampler Kitchen Towel, by Raghu. Features embroidery of various spring icons, and "Spring" on a tea-dyed cotton patch, appliqued to a sage green striped kitchen towel. 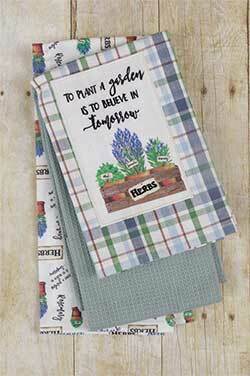 Trellis Dishtowel, by Tag. 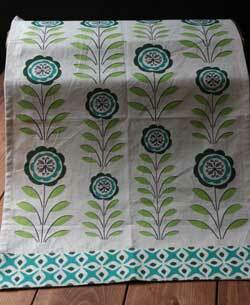 Printed cotton towel in floral design in shades of green and teal, with a geometric border. Part of The Gardener Collection. 100% cotton. Measures 18 x 26 inches. Tulips Embroidered Dishtowel, by DII. 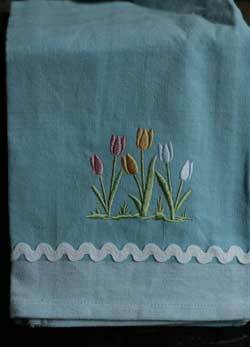 Colored a light blue, and embellished with white rick rack, this dishtowel is embroidered with colorful tulips. 100% cotton. 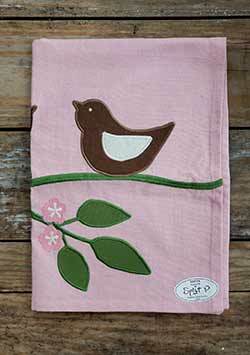 Wren Embroidered Dishtowel, by Park Designs. The Robin's Egg Collection is a beautiful striped pattern of robin's egg blue and celery green, with touches of brown and orange. 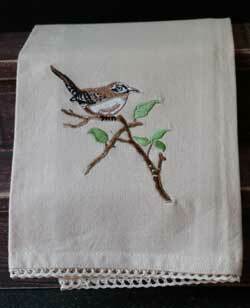 This is for the coordinating Wren Embroidered Dishtowel. 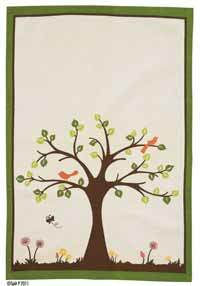 Features an embroidered wren and branch on a beige background, with small ribbon edging. 100% Cotton, machine washable. You Are My Sunshine Towel, by Raghu. 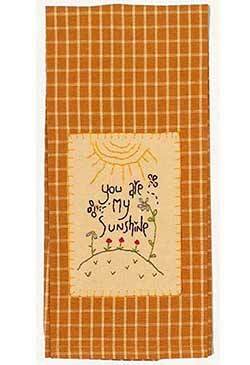 Features embroidery of a sun and flowers, and "You are my sunshine" on a tea-dyed cotton patch, appliqued to a country mustard and tan plaid kitchen towel.